Anterior Cruciate Ligament (ACL) rupture is very common particularly among young people who participate in competitive sports. The most common symptom after ACL rupture is instability, where the knee feels as if it will ‘give way’ particularly during rotational movements. However pain, recurrent swelling and locking of the knee are also fairly common symptoms especially if there is associated damage to either the articular cartilage or either of the menisci (See Cartilage Injuries). 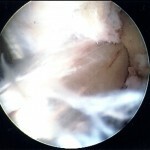 The indication for reconstruction of the ACL is persistent instability. 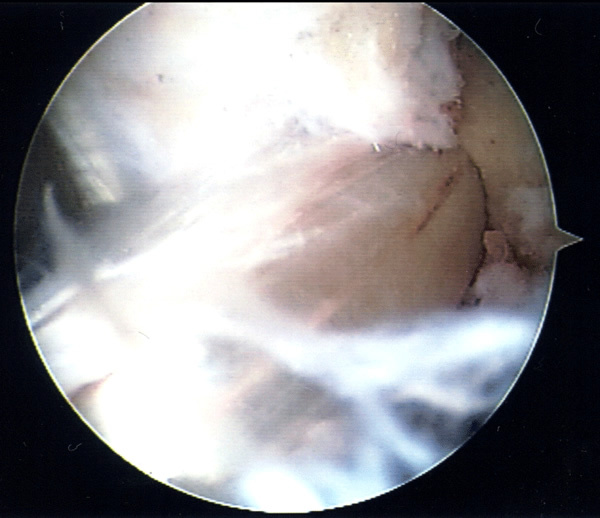 If a ruptured ACL is left untreated there is a very high risk of subsequent tears to the menisci and damage to the articular cartilage. By reconstructing the ACL and thereby stabilising the knee this risk may be minimised and may therefore reduce the likelihood of osteoarthritis developing in later years. 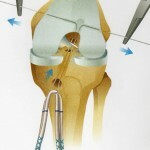 The outcome of ACL reconstruction is improved with earlier surgery. The current recommendation is for early rehabilitation with physiotherapy to regain movement and muscle strength followed by surgery within 6-12 weeks from injury. However if the diagnosis is initially not made, reconstruction can be undertaken at a later time. 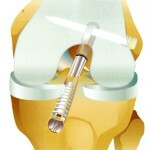 ACL reconstruction involves an inpatient stay of 2-3 days. The operation is performed under a general anaesthetic. The patient is usually admitted on the day of surgery and will need to remain fasted for 6 hours prior to the procedure. The surgeon will see the patient before their operation and will mark the leg to be operated on. 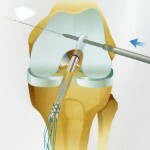 During ACL reconstruction, a new ligament is made by harvesting tissue from the patient; this is called an autograft. 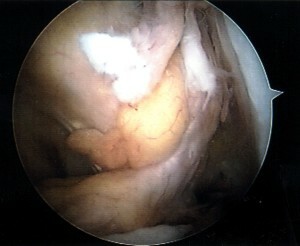 Two common autografts are used; either from the patellar (kneecap) tendon or by combining two of the hamstring tendons. The outcome from both is similar but there is slightly less scarring with hamstring reconstruction. ACL reconstruction is carried out arthroscopically (keyhole surgery) which enables treatment of any other problems within the knee, e.g. torn menisci, at the same time. Drill holes are made in the tibia and femur where the ACL used to be. The graft is then passed through these holes, tightened and fixed at both ends (see picture). 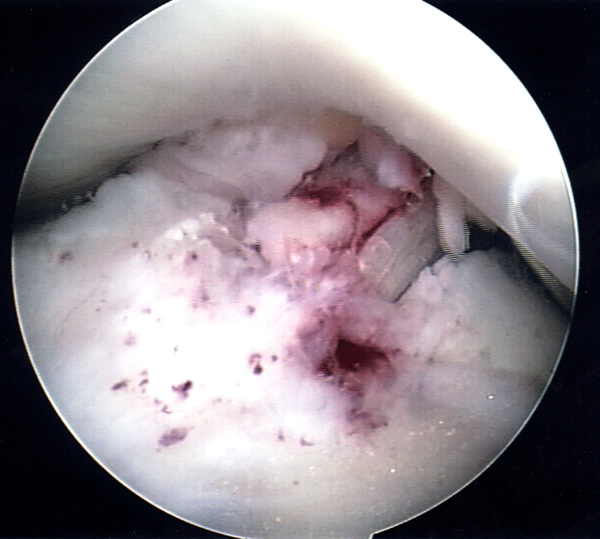 This graft acts as a scaffold; the body slowly grows a new ACL over the graft. This takes between 4 and 6 months. Smoking significantly affects this process and must be stopped prior to surgery. At the end of the operation a drain is usually inserted into the knee; this is removed 24 hours later. The wounds are closed with absorbable sutures and steristrips, dressings applied, and a bandage placed around the knee. During these phases the reconstructed ligament must be protected – the physiotherapists supervise ACL rehabilitation programmes carefully. It takes approximately 6 months before sports-specific training can be undertaken, and return to full sporting activities is usually between 8-9 months. 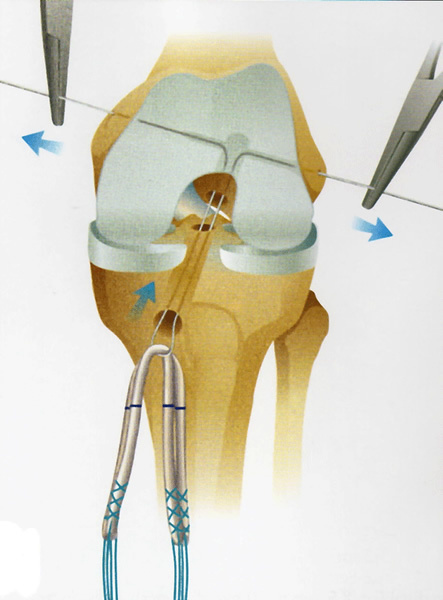 No operation can guarantee success but the risks of ACL reconstruction are low. 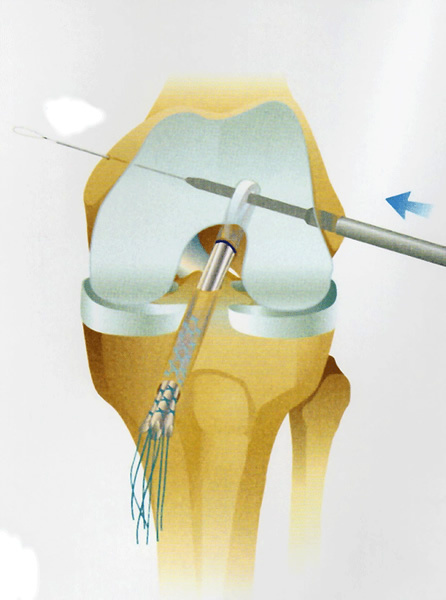 Complications due to general anaesthetic are rare as most people undergoing ACL reconstruction are relatively young. Occasionally there is significant bleeding into the joint after surgery. On rare occasions, further arthroscopy is needed to wash out the blood. Small skin nerves are not visible to the naked eye and can be damaged by any surgical incision causing an area of numbness on the skin and occasionally a painful swelling on the nerve (a neuroma). 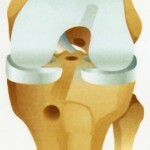 Antibiotics are routinely used in ACL reconstruction but infections do occasionally occur. Small skin infections related to sutures (stitch abscess) are relatively common and can be treated with antibiotics. 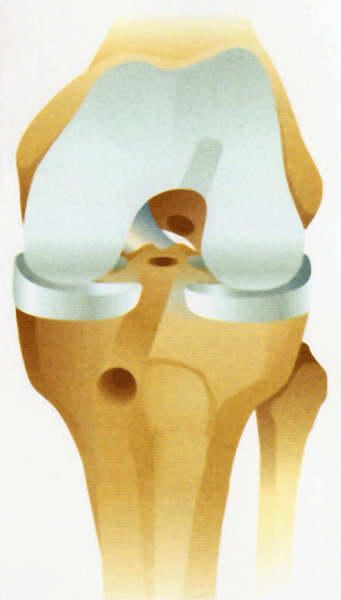 Very rarely (approximately 1 in 500) the knee joint itself becomes infected. This is an emergency and requires arthroscopy to wash out the infection followed by a long course of antibiotics. Signs of this are sudden swelling and pain in the knee associated with a fever and restriction of knee movement. 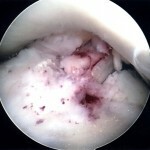 In less than 5% of cases the reconstructed ACL re-ruptures. This is usually due to a significant injury, similar to the initial rupture, but the graft is more prone to re-rupture during the first 4-6 months as the new ligament develops. Restriction of activity is therefore very important. There are also surgical factors that contribute to re-rupture; this is why ACL reconstruction should only be undertaken by specialists in knee surgery.